Emily contacted me last summer about creating a wedding invitation for her December wedding. 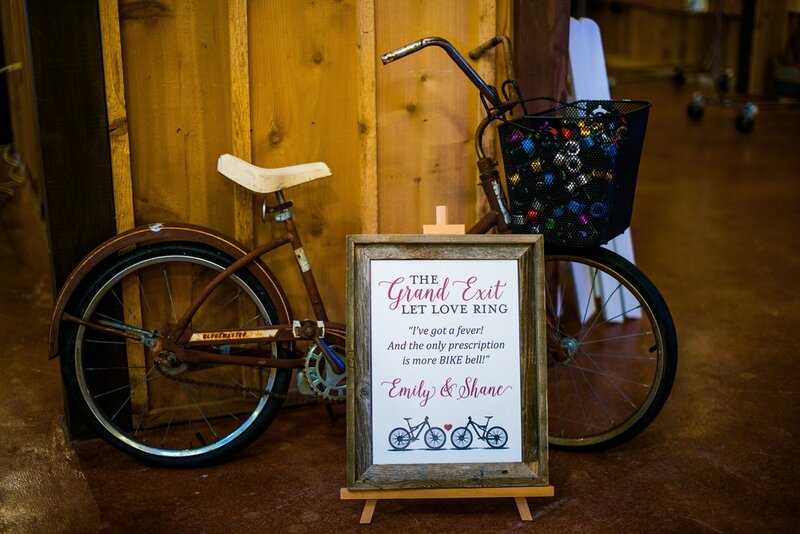 She and Shane are both avid cyclists and they fell in love with the invitations I created for Melissa & Patrick. So I was happy to create something that fit the colors and style for their wedding. Emily was gracious enough to send me one of their invitations. They went with a gatefolded invitation with just one RSVP card insert. The sillhouettes of the bicycles and the tandem bicycle are all of Emily and Shane's actual bikes! They had everything printed on a lovely linen card stock, it really added a classy texture. Don't stress, I changed their address. For the wedding itself, we also created some fun signs. These photos were taken by their awesome wedding photographer Ashley Russ. If you click on any of the photos below, you'll head over to her website. This sign is my favorite: "I've got a fever! And the only prescription is more BIKE bell!" I wonder how many guests got the fun SNL reference. Guests wrote their well wishes onto the wood boards displayed in the background. It will make for some really cool wall art for their home. Rather than print out a hundred or so programs for guests, they printed one large program that sat in an entryway for guests to know the afternoon's schedule. They had a local food truck that specializes in fancy grilled cheese providing dinner for the evening. Yum! It looks like it was a really lovely wedding, congratulations Shane and Emily!! My husband and I celebrated our 10th wedding anniversary last month, and to commemorate, we renewed our vows in front of a couple of friends and family members in Las Vegas. Back when we were planning our wedding in 2007, and kind of over the craziness, we joked about flying to Las Vegas and eloping. My husband confessed that he'd LOVE to have our ceremony officiated by none other than Elvis Presley. We agreed that day that we'd renew on our 10th anniversary with Elvis. And we did! Even though we weren't planning anything extravagant, I still wanted to create an invitation for the occasion. I was going for fun, but not cheesy, and I wanted to slyly put Elvis in there somewhere. The skyline of Las Vegas and a bokeh background worked perfectly to convey the mood I wanted to. I mailed these to friends and family in metallic red envelopes that I ordered from Cards and Pockets; the Jupiter color. They coordinated beautifully with the invitations. I printed names and addresses on each one with my laser printer. We renewed our vows at the Graceland Wedding Chapel, Elvis sang a few songs and performed the ceremony. It was cheesy and so much fun!! So many thanks to everyone who has supported us over these last ten years. We were back at FotoFly this past fall to take some fun photos with Santa. I donned the Santa suit this year as we brainstormed with our photographer some new poses that would work for our two boys. My oldest asked he we could take a selfie with Santa and it ended up being the best photo. For some reason, we were busier than usual this year and failed to get matching PJs figured out in time for the photo shoot. I asked my boys what they wanted to wear and Hawaiian shirts won. I only wish I had thought to throw a "hang loose" sign with my right hand when we shot this. 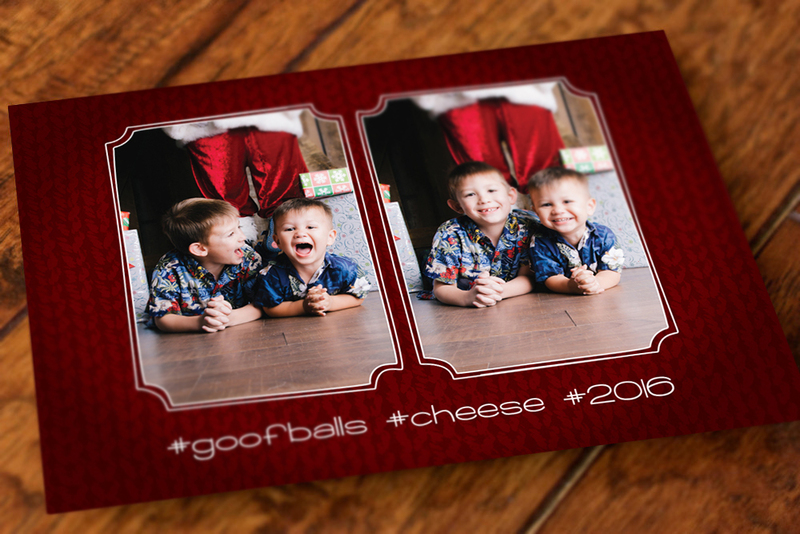 The back was kept simple with my boys showing off their goofball selves. This holiday card design is available in my Etsy shop in the fall where I use your family photos. You can see the listing here. Merry Christmas! Trish and Matt wanted to have papel picado adorn their wedding invitations using their color scheme of red and aqua. I love how they worded the invitation to reflect the joining of their whole family, including their son Zachary. We created a custom papel picado of the Swiss flag to commemorate Trish's dad who'd passed away.